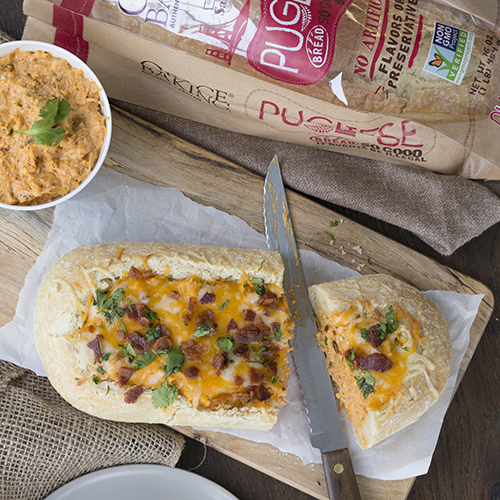 There’s a logic problem with the name of our amazing Stuffed Buffalo Chicken Bread. When our chefs first floated the idea our staffers couldn’t hide their confusion… how big, exactly, was a “Buffalo Chicken”? A few just donned their bibs hoping it might actually be “Stuffed Buffalo. Once everything was cleared up our now ravenous office crew dug into our mouthwatering open-faced sandwiches made with our Grace® Baking Pugliese Bread and filled to overflowing with spicy chicken, 3-cheeses, spices, and topped with crumbly bacon. No buffalo, sorry. Preheat oven to 350°F. In a large mixing bowl, combine chicken, ranch seasoning, cream cheese, sour cream and buffalo sauce. Stir in ½ cup each of Cheddar and Mozzarella cheeses. Cut the top off the bread loaf and hollow out the inside (reserve bread you remove for another use). Fill loaf with chicken mixture and bake until hot and bubbly (approximately 15-20 minutes). Top with remaining cheeses, bacon and cilantro then slice and serve.